The latest, and most likely, program theory of aging is the telomere shortening theory. Telomeres are the end-cap segments of DNA (our genetic material). Each time a cell replicates, a small piece of DNA is taken off the end of each chromosome. The shorter the telomere gets, the more it affects gene expression. The result is cellular aging and an increased risk for immune dysfunction, heart disease, cancer, Alzheimer's disease, and other degenerative diseases. Simply adopting a comprehensive dietary and lifestyle change consistent with good health has been shown to preserve telomere length. Physical exercise has been shown to be associated with preserving telomere length. Meditation has been shown to preserve telomere length by reducing the negative effects of stress. Higher vitamin D levels are associated with longer telomeres. Since levels of inflammatory markers in the blood correlate with telomere shortening, natural strategies that reduce inflammation are very important in reducing the rate of telomere shortening. Although telomeres shorten with each cell division, dividing cells express telomerase, a protein complex that synthesizes and elongates telomeres. 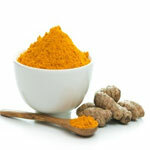 Researchers hypothesized that curcumin could increase telomerase expression and thereby help preserve telomere length. To test their hypothesis, they chose to look at its effects on telomerase expression in brain cells exposed to beta-amyloid, a key source of oxidative damage and brain cell death linked to Alzheimer's disease. Researchers measured the effects of curcumin on cell survival and cell growth, intracellular oxidative stress and telomerase expression in these brain cells. Results indicate that the brain protecting effects of curcumin in Alzheimer's may be primarily due to its effects on telomerase expression. When telomerase expression was inhibited the protective effects produced by curcumin disappeared. There is considerable experimental evidence that curcumin, the yellow pigment of turmeric, protects against age-related brain damage and in particular, Alzheimer's disease. Unfortunately, the two clinical trials conducted to date failed to show any benefit. However, the failure to produce positive results may have been due to the poor absorption profile of the curcumin used in the trials. Of all curcumin products on the market, Theracurmin® shows the greatest absorption by a significant margin. Currently there is a double-blind, placebo-controlled study underway with Theracurmin® in Alzheimer's disease being conducted at UCLA. Researchers are optimistic will produce positive results due to its enhanced absorption.